A composer and his sister discover that the reason they are able to purchase a beautiful gothic seacoast mansion very cheaply is the house’s unsavory past. That’s not because there are most ghosts here then other places, mind you. It’s just that people who live here about are strangely aware of them. You see, day and night, year in, year out, they listen to the pound and stir of the waves. There’s life and death in that restless sound. And eternity too. 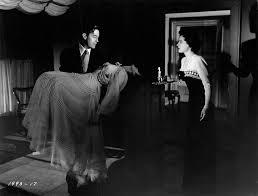 Director Lewis Allen (The Unseen, Bonanza, Mission: Impossible) was quite ahead of the curve when he decided to set aside flash and style and make a “serious” ghost story with some substance when he took on “The Uninvited” back in 1944. This very popular but sometimes elusive film (recently, it has had a bit of a resurgence of sorts on Cable TV, especially on TCM) is highly regarded these days for good reason. It works and accomplishes what it sets out to do: Give us a fright. 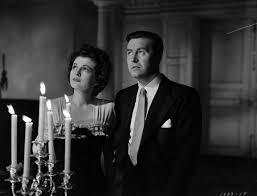 It is no easy task and with stars Ray Milland (The Lost Weekend, Dial M For Murder) and Ruth Hussey (The Philadelphia Story) the movie is elevated to a whole other level with good performances, a chilling story and some simple scare tactics that are effective until this day. They buy the home with some difficulty from the stalwart Commander Beech (Donald Crisp) and eventually settle into the home. Right away, things seem a bit off when their dog refuses to make his way up to the second floor. 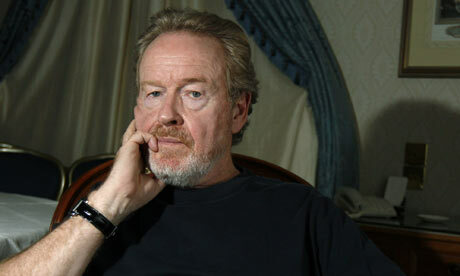 Allen spaces and unfolds the movie with total seriousness with respect to the material. It is a mature and realistic approach to what could have easily been a sort of comical passage. Rick and Pam discover an Artist’s Studio and Rick decides to move right in in order to start writing his music. They also meet the young grand daughter of Comm. Beech named Stella (Gail Russell). At first she is opposed to the sale of the home since it was her Mother that had died there and she remembers her early childhood there. Rick and Stella grow close much to the chagrin of Beech. But there are other reasons afoot for the Commander’s disapproval and Allen draws upon both mystery and mystique to tell his story. There is nothing routine to “The Uninvited” in Allen’s hands. Even though it may appear on one level to be a gothic mystery, we get, instead an effective ghost story that is sophisticated and mellow. It makes the film even more accessible to the masses. Meanwhile, strange things keep happening. Pam and Rick continue to hear wailing and crying through out the night and in one sequence they listen in as the wailing eventually fades away as the dawn approaches. This effective scene is a standout and cements the film as a true gothic fable. 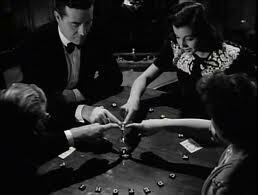 Allen supplies cold spots, eerie piano music, shadows, a hysterical maid (played comically by Barbara Everest) and even a small subplot involving Beech and a mysterious woman named Ms. Holloway (Cornelia Skinner) who is creepy as all get out. Alan Napier rounds of the impressive cast as a friend and physician to Stella named Scott. With these actors and a great story, Allen makes this early attempt at serious terror a very palpable event to watch unfold. Major kudos and props go to the Cinematographer Charles Lang, who also did “The Ghost and Mrs Muir.” His absolutely incredible eye for detail, light and shadow creates mood and atmosphere that places it squarely in noir-ish territory. Also his panoramic sequences (like the shots of the coast and countryside) look pristine and his use of clear focus and establishing shots are technically imposing. The film is everything you can ask for in a English Coastal spook story. 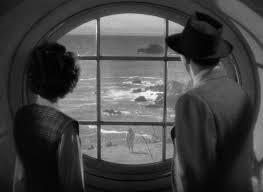 Big houses, witty dialogue wind torn coasts and cliffs, wails in the night, dark hallways, room and scared animals. It’s all here. The one big draw for me was the unseen presence itself, eventually we do see a phantasm and it looks pretty killer for a film from the 1940’s. Just chilling. 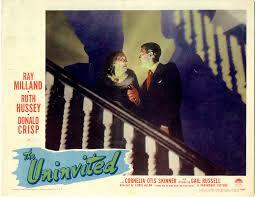 “The Uninvited” remains an absorbing film to this day. 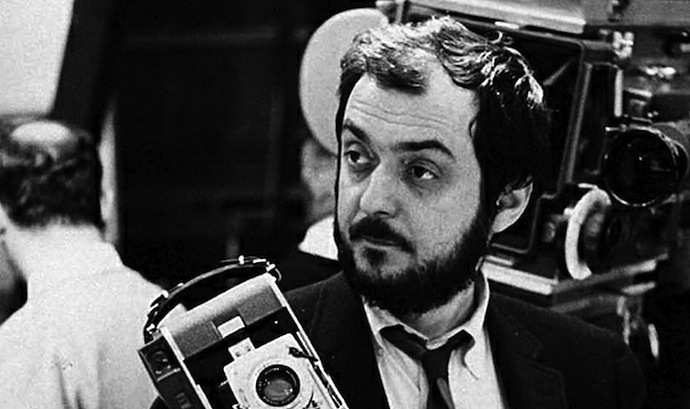 It never feels dated and it is completely impassioned and stately to watch. It remains old fashioned (Milland and Hussey remind me of Grant and Russell from “His Girl Friday”), powerful and downright unsettling. 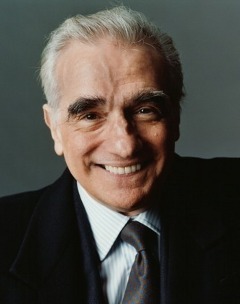 It is in every sense of the word what it claims to be: A “Comfort” film. One late night when the wind and rain lash against the creaky walls of your home, pop in “The Uninvited” and burn a candle just in case the lights go out…. 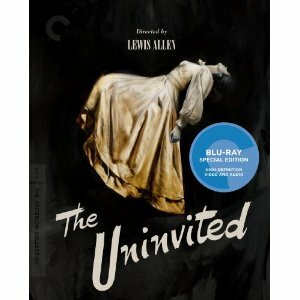 “The Uninvited” is now available on Blu Ray from The Criterion Collection! Highly Recommended. Nice writeup. 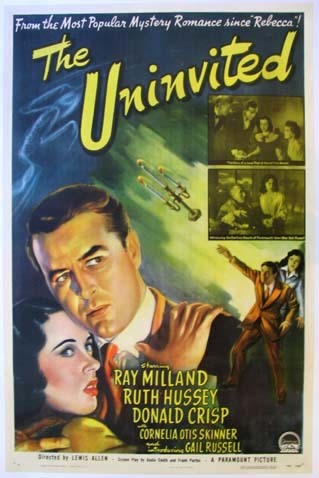 I like The Uninvited because it’s scary, but also because I didn’t figure out the mystery. Exactly! When I re-visited it recently, I didn’t recall much of the story. So the twist was a very cool surprise indeed. Thanks for reading the review and for stopping by. Glad you liked it.